Photos -- by the author. Arriving here early on Monday morning allowed me to maximise my time in Chandigarh. It’s a city of stark contrast to Amritsar. The roads are wide and straight, the views from my hotel are of a green tree canopy and most of the shops are of easily recognisable brands. The dirt and dust of Amritsar is nowhere to be seen. And the only historic buildings I’ve seen here are all ones designed by Le Corbusier, the famed modernist architect. He had the opportunity to design the layout of one of the world’s most modern cities in the 1950s. His creations included both the museum and art gallery that I visited. My encounter of the day was with my dear friend and Duleep Singh historian, Bhupinder ‘Peter’ Singh Bance. Peter has helped me plan my trip and I was delighted when he said he’d be in Amritsar for a few days whilst I was there. Yesterday I had the opportunity to catch up with him again before he headed back to England before my first major meeting of my trip. Following my site visits in Amritsar, Mr Navjot Singh Randhawa, Director of Tourism, Cultural Affairs, Archaeology, Museums & Archives, Punjab, had offered me the opportunity to meet with him whilst I was here. Not only was I able thank him personally for allowing me access to sites and collections not normally open to the public, but also to ask a few questions. We were joined by Gurmeet Kaur Rai, the conservation architect for the Gobindgarh Fort project. Gurmeet is very keen to develop some joint working relationship, particularly linking some of the Anglo-Sikh Heritage Trail (“ASHT”) sites with those in Punjab and possibly a knowledge network. I was also presented with a folio of Emily Eden prints for the museum. It was a fantastic positive start to my work in Chandigarh. Later in the afternoon Dr Aujla took Peter and I to the Punjab Digital Library. Thanks to Davinder Pal Singh’s innovation thousands of documents, photographs, newspapers, coins and books have been digitally copied and are available for use, for free. The data base is extensive. Not only has the library developed its own specialist equipment to use, it has also developed its own cataloguing system similar to MODES. The Library receives private funding and is committed to preserving the history of the Punjab as a whole. I will be requesting copies of material for use at the Ancient House Museum once I return home. 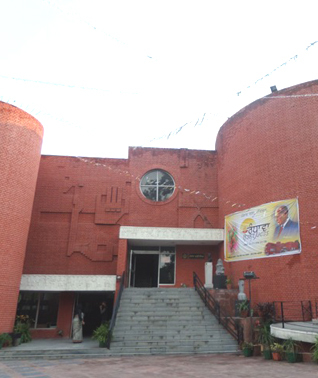 Tuesday started with a visit to the Chandigarh Government Museum and Art Gallery, and meeting Seema Gera. I was delighted to see their collection of phulkaris and to be offered digital copies by Seema. 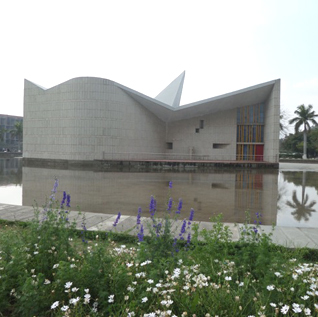 The museum is housed in a Le Corbusier building from the 1950s and there is a dedicated display about the city’s development. I really enjoyed exploring the textile gallery. Seema is very knowledgeable about the objects and, more importantly, very passionate about the museum. We talked about the differences between our museum structures and how we could help each other. I gave the museum a copy of the Norfolk Catalogue featuring Prince Frederick Duleep Singh’s painting collection, for their library. It’s great to know that something from and about the Ancient House Museum is sitting in another museum collection in Punjab! After lunch it was time for a visit to the Government Emporium followed by a quick look at the Panjab University to see its iconic Le Corbusier buildings. The campus looked like a great place to study; it reminded me of the UEA. My last visit of the day was to the Arts Council, who were holding the final day of their annual arts festival. I adored Anuradha Thakur’s Ethnic Expeditions exhibition, and was delighted to meet her. Anuradha was lovely and keen to talk about her work, created by spending time in villages experiencing tribal life. One of the government ministers, Parmider Singh Dhinsa was in attendance, so there were plenty of armed guards around the site. After we were introduced, he took quite an interest in the Ancient House Museum and the story of why I was in Punjab. Thinking I was there merely to watch a presentation ceremony and to meet the Arts Council chair, I suddenly found myself called up on stage and presented with a gift – unfortunately my Punjabi hasn’t progressed, so I just smiled and clapped in what I hope was at all the right places! I’ve loved my past two days in Chandigarh. It’s a vibrant city with a strong arts focus. Dr Aujla has been supportive but has allowed me the space to get on with the work I need to do, so as I approach my last day here I can reflect back positively. And one final bonus: he introduced me to a textile researcher, Jasvinder Kaur, who is taking me on an intrepid search for real, live phulkari embroiders in a village just outside Chandigarh in the morning! One last thing: look what I saw in the Government Emporium here … a colourful manifestation of our Duleep Singh himself! And peeping over his shoulder … Rani Jind Kaur. 1: Kaala Singh (Punjab), March 04, 2015, 10:43 AM. Why is the "Mecca" and "Jerusalem" of Sikhs -- Amritsar -- not like Chandigarh, or should I ask why is Chandigarh not like Amritsar? It's because Chandigarh is not controlled by the corrupt politicians of Punjab. It has a huge budget for its upkeep while Punjab's politicians haven't even spared money to pay salaries to government employees! 2: RP Singh (Palo Alto, California, USA), March 04, 2015, 5:45 PM. @Kaala Singh ji: Surely corruption is a problem in Punjab, but you actually answered part of your own question in your comment. Many of the businesses that work in Punjab have their headquarters in Chandigarh, making the Union Territory flush with tax revenue that could be going to (and possibly of course, squandered in) Punjab. 3: Harinder Singh 1469 (New Delhi, India), March 05, 2015, 4:07 AM. The City of Le Corbusier "